Maximize weight loss and jump-start your metabolism with this full body intermediate dumbbell complex. Complexes are simply a series of full body exercises done back to back using weights, that can help you burn fat and speed up your metabolism during exercise and for hours afterward. Start this full body dumbbell complex with a thorough warm up routine. 1. High knees: 60 seconds. Stand straight with your feet shoulder width apart, bring your knees up to waist level and then slowly land on the balls of your feet. 2. Squat curl: 30 seconds. Combine bodyweight squats with biceps curls and curl as you press your hips back and squat. 3. Reverse lunge shoulder press: 30 seconds + 30 seconds. Start with your feet shoulder-width apart and position the dumbbells at your shoulders. Take a step back with your right leg and lunge. As you stand back up push the dumbbells up and lift your right knee up to waist level. Repeat for 30 seconds and then switch legs. 4. Sumo squat side crunch: 20 seconds + 20 seconds. Start with your feet in a wide stance, your hips back and your thighs parallel to the floor. Crunch to the right side for 20 seconds, switch sides and repeat. 5. Romanian deadlift wide row: 45 seconds. Pair the romanian deadlift with the wide row move to strengthen your hamstrings, glutes and upper back. 6. Side lunge front raise: 30 seconds + 30 seconds. Stand with your feet hip-width apart, step out to the side with your right foot and raise your arms to the front until they’re parallel to the floor. Return to the starting position, repeat for 30 seconds and then switch sides. 7. Skaters: 45 seconds. Lean forward with your back flat, jump to the right, bring your left foot behind you and bring your left arm in front of you. Jump to the left and bring your right arm in front of you and your right foot behind you. Repeat for 45 seconds. 8. Wood chop: 30 seconds + 30 seconds. 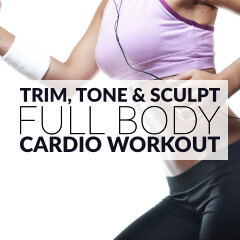 Stand with your feet shoulder-width apart and hold a dumbbell with both hands. Rotate your torso to the right and raise the dumbbell until it’s over the right shoulder. Squat as you rotate your torso to the left, and bring the dumbbell diagonally across the body until it’s close to your left hip. Repeat for 30 seconds and then switch sides. 9. Thrusters: 30 seconds. Hold the dumbbells in front of your shoulders, squat and, as you stand up, extend your arms above your head. 10. Plank jacks: 30 seconds. Start in a push up position with your feet together. Hop your feet as far as you can and land softly on your toes. Jump again to bring your feet back together and repeat the exercise. Stretch your muscles and relax your body with a full body stretching routine. 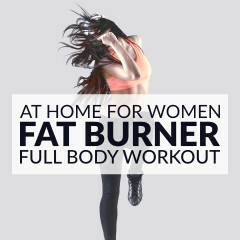 Maximize weight loss & jump start your metabolism with this full body dumbbell complex!